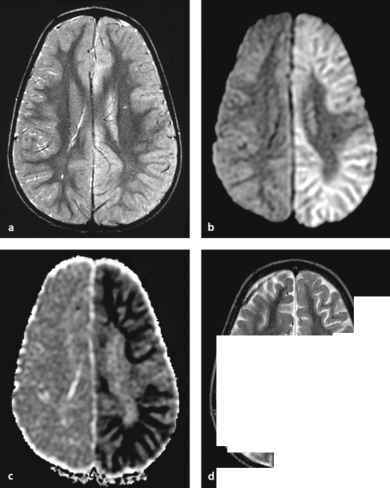 Computed tomography (CT) is still essential in the diagnosis of acute subarachnoid hemorrhages (Fig. 6.5), as the sensitivity and usefulness of MR imaging is controversial [4,5,9,34,39-45]. Fluid-attenuated inversion-recovery (FLAIR) imaging has a high sensitivity for subarachnoid hemorrhage [46-49]. 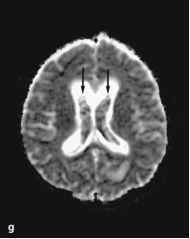 However, the specificity is low because there are several other causes for the appearance of subarachnoid hemorrhage on FLAIR imaging, such as high proton concentration, mass effect, vascular disease, contrast medium and use of specific intravenous anesthetic agents [50-53]. It is often difficult to detect subarachnoid hemorrhage on DW images [31,54]. Lin et al. 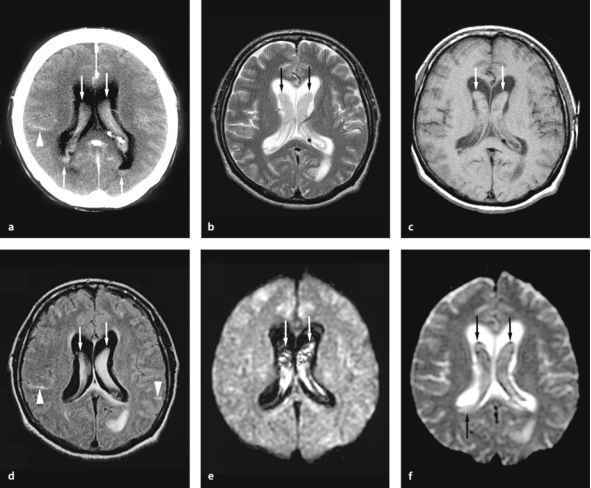 detected subarachnoid hemorrhage in two of four cases on GRE imaging, but it could not be detected on b0 images . Wiesmann et al. reported that proton density and FLAIR images could detect subarachnoid hemorrhage, but T2-weighted and DW images could not . However, DW images may be useful to visualize parenchymal injuries secondary to subarachnoid hemorrhage. Ischemic changes, probably related to subarachnoid hemorrhage, have shown hyperinten-sity on DW images in both clinical and animal studies [55-60]. This finding depends on the timing of imaging and the severity of injury.